Recorded Programs are stored in a folder called /DataFiles. Each recording consists of 3 files: .mpg (the video), .nav (to help with navigating the file), and .inf (for information about the recording). The name of the Recorded Program is the actual filename of the files in the filesystem and for this reason if you record a second program with the same name it will be named with a "-2" after it to avoid filename clashes. If a recording loses its inf or mpg files it will not show up in the Recorded Programs list. If you still have the mpg file then you can move it to the /MediaFiles folder where it can be played with the Media Player. It will show up in the Media Player list as long as it is one of the supported playback types, which includes mpg. The top left section contains a series of snapshots from the recording. If created, these will scroll through when you highlight the Recorded Program containing them. If a recorded program shows "Rec" in the window then a snapshot has not been created for it. You can manually do this by pressing the Record button to make the snapshot. 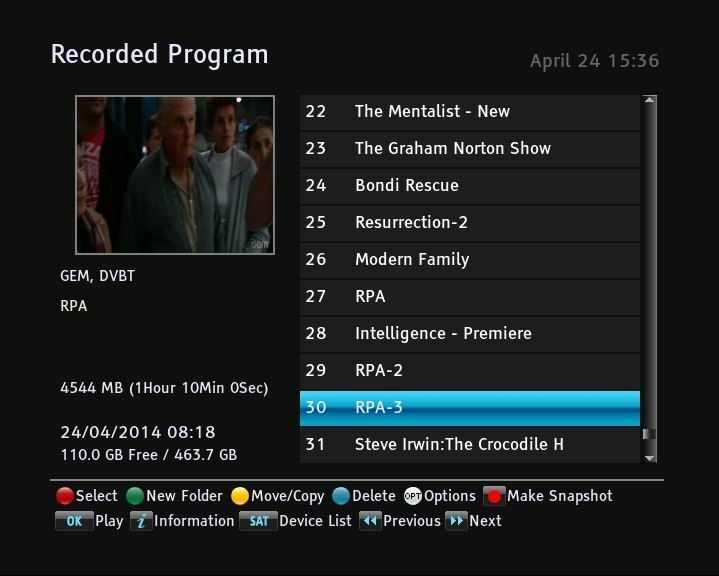 Below the snapshot window you will see the Channel name of the recording followed by its description (taken from the EPG program name/short description). If the recording is from a manual reservation then no description will be shown. Below the description is the recording size in MB and recording duration, followed by the recording date and time of when the recording started. Note that the recording duration may be longer than the EPG program's duration if you have front or read padding enabled. For an in progress recording there will not be any description but rather it will show the total expected recording time, and the recorded amount so far. Finally at the bottom of the left column you will find the amount of total disk space free and the total disk space in GB. Total disk space will always be less than the maximum capacity of the drive as some space is taken up for the filesytem management details as well as a hidden partition used for firmware updates and Game data. For example on a 500GB drive you will have about 460GB of space to use. On the right hand side is the list of the Recordings in date order (by default) from oldest to newest. You can change the sort order by pressing the white Options button and change "Sorting" to either "Alphabetic" or "Size".